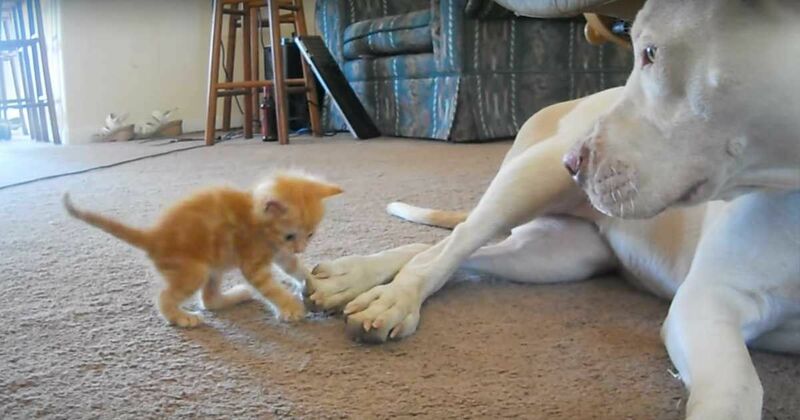 Licious the pit bull got a new friend and it's definitely the cutest thing on the Internet. When the owner decided to introduce a kitten to the family, she probably didn't expect just how sweet the interaction would be. In a YouTube video, viewers can see firsthand just how much the duo enjoys playing together. The kitten is definitely interested in Licious' paws, probably because they are about the same size as her tiny little body! The pup watches the kitten with calm interest as the playful feline bats around. The most precious thing ever is when the dog's tail starts wagging and you can see the kitten start to zone in on it for a playful attack.However, kitty is quickly sidetracked by a sloppy kiss from Licious. According to additional videos posted by the owner, the dog and cat still enjoy romping around together. Dog and cat lovers everywhere will get a kick out of this! If you want even more of a reason to love this video, the science behind the dog's behavior really says a lot about the dog's playful motives. According to an article from Scientific American, dogs that roll over during play sometimes do so as a "self handicap". Often times, larger animals will do this for smaller animals not only to promote play, but to allow the smaller animal the opportunity to safely nip and mouth the bigger dog or cat. Here is a clip of the pair playing together as Licious assumes the position for the kitty to attack. Clearly, they love to play together! As a reminder from Paws.org, you should always take precautions when introducing animals--especially smaller and larger animals. Allow the pair to get to know each other in a controlled environment with plenty of room to safely explore. However, as Licious and her kitty clearly indicate, size doesn't matter when it comes to friendship!